Amy's Classic Movie Blog - Now with Jessica Added! A place to review classic movies I watch and note the highlights. I give every movie 1-4 stars and also declare whether I ever plan to watch it again. (A sad movie might get 4 stars but I'll never want to watch it again - on the other hand I might watch an awesomely bad movie 10 times). Favorite actor... favorite actress... yet another movie I had a hard time paying attention to without rolling my eyes. Myrna Loy plays a stunt pilot. Cary Grant plays a daring pilot who wants to be one of the first pilots to fly blind (the first? I can't remember!) Of course Loy has long admired Grant before she even gets to meet him. And of course Grant is blinded by a freak accident with a stove. What will become of Grant's budding relationship with Loy? What will become of his ambitious plan to... fly blind? 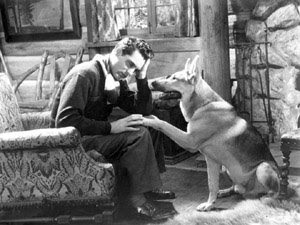 Devastated Grant secludes himself in a cabin in the woods until Loy and a helper sneak up on him and make him accept a seeing eye dog into his life. Before the dog he has to wander around with his arms outstretched. More touching scenes and tragedy ensue. One star for the seeing eye dog. Yeah sometimes it amazes me how many duds even my favorite actors made - you have to remember too that most of the time they had no say in it - so brave brave actors like Burt Lancaster and Bette Davis fought for independence from the studio system - so that someday Nicholas Cage could CHOOSE to make 3000 Miles to Graceland.